I’ve mentioned the heat wave that’s occurring on planet Quebec City and it still rages on. Yvan and I thought that maybe we should sketch in my backyard, which is shady and close to a fridge full of ice cold water. This turned out to be a good idea and we had some fun in spite of the heat. 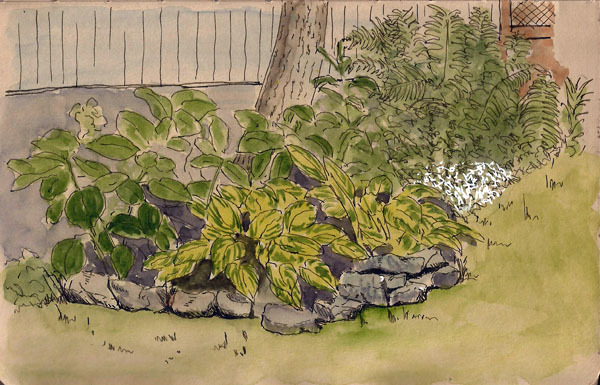 Here’s a sketch I did of part of the perimeter of our yard. Too many leaves. I’m still trying to integrate my life as a sketcher with my life as a gimpy old man with a bad wrist but I’m finding the problems managable, which makes me happy as a clam. An arthritic clam for sure, but a happy one. I just got back from Montreal. Went there with a friend and thus I didn’t get to sketch at all, but when I got back I contacted my buddy Yvan about sketching. We decided to head to what was Quebec City’s zoo. A small portion of it has been turned into a park and we figured we could find some shade there and something to draw. Shade was more important than subject because we’re in the middle of canicule, the time when we start feeling foolish for having complained so much about the cold. Called the ‘dog days of summer’ in English, or on the streets, ‘hotter-than-hell,’ this is the time of people go to hospitals with heat exhaustion. We went sketching. Truth is, it hasn’t been horrible for us on planet Quebec City because while temps and humidity are very high, we’ve had a nice breeze which has kept conditions tolerable. Oh, and we had shade, lots of shade. 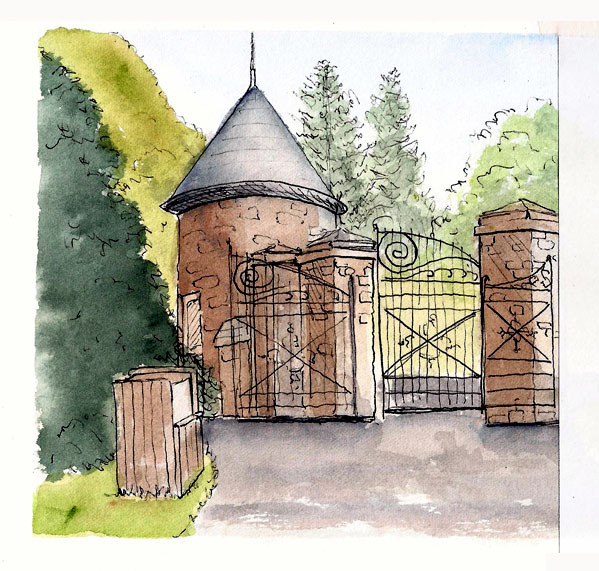 We decided to draw the entry gate to the park. It’s a great subject and I didn’t do it justice. I have to say that I’m out of practice. While I include my drawing and seeing skills in this mostly I’m talking about my juggling skills. I only have two hands and a mouth that can sometimes provide hand-like assistance, so drawing and painting while sitting on a stool is a practiced skill. On this day I was dropping things constantly. My paper towel blew away several times. The water spilled. I knocked my palette off its perch. But I got to sketch and that’s what was important. Not my best sketch ever but sketching isn’t about what you produce, or it shouldn’t be. Here it is, warts and all. I’ve mentioned the Collectif before, whose complete name is Collectif des ateliers libres en arts visuels de Québec because people here love long, impossible to remember names. They are mostly a portrait group and like nothing more than to sit around a naked person while they draw in a stuffy room. In recent years, though, they’ve discovered that sketching outdoors is fun, too, and so have started scheduling outdoor events during the summer. They scheduled an event at a large garden in Ste-Foy, or rather Quebec City. Which name you use depends on whether you acknowledge the aggregation of the small cities into what now makes up metro-Quebec City. For me it will always be Ste-Foy though I realize that people reading this blog might be confused by my using the two names to refer to the same place. Such is life on planet Quebec City. The garden is a large one but mostly rows and rows of different species of plants, and thus most of it is not the same as a typical botanical garden. If I knew more about gardens I’d probably know why this is the case. In any event, it’s a great place to draw flowers but I didn’t do that on this day. 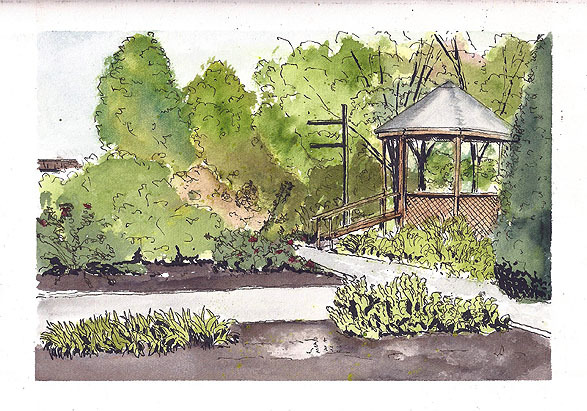 Instead, I drew a small kiosk and the surrounding vegetation. It was a nice day and the sketching was relaxing. When I was done I walked around to talk with everyone and to look at what everyone was drawing. By the time that was done my knee was screaming at me and so I settled for the one sketch for the day. I hope you like it. 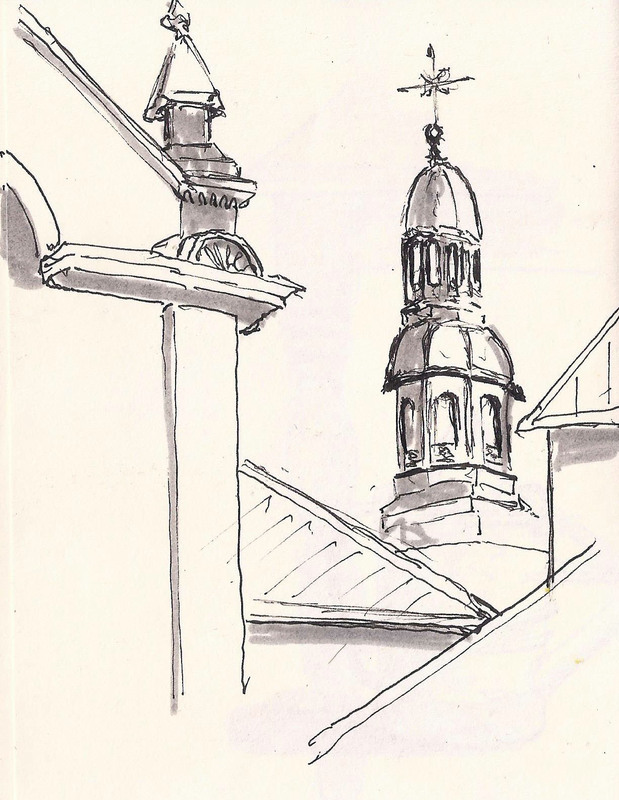 When I was first learning about urban sketching my mentor (though she didn’t know it) was Cathy Johnson. I fell in love with her sketches, many of which appeared to me in books by her about nature, historical reinactment, and art books. Another thing she showed me how interesting and beautiful an artist can make the mundane and ugly. She’d paint broken down buildings as seen through rusty chain link fence. She did a sketch of a bridge being torn apart. And she did these things in a way that made you want to hang them on your living room wall. I still aspire to have her abilities but one of the great things about being a sketcher is that with only a dollup of persistence you can try and try again. 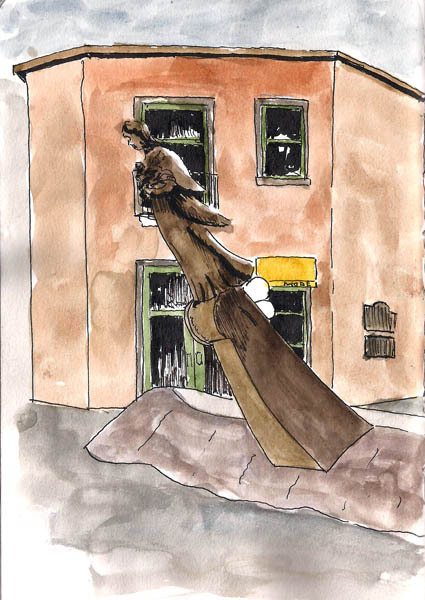 I’ve spent more than a little time drawing the alleyways of the older parts of Quebec City. These are cluttered, ill-maintained places that are mostly out of sight and out of mind. 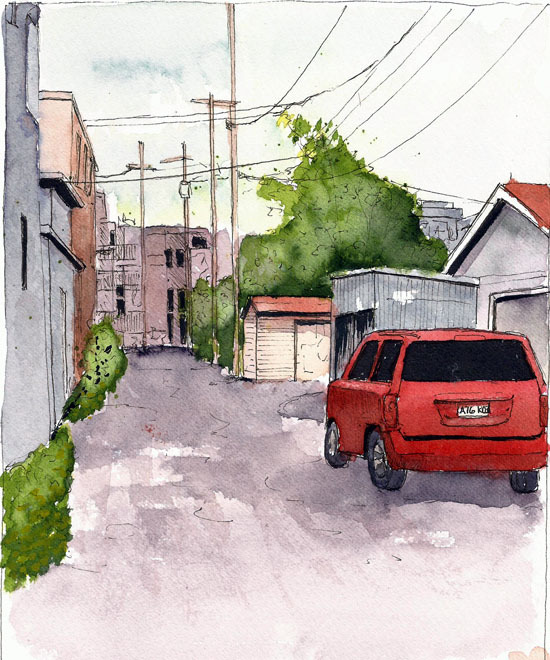 While I may not have Cathy’s expertise, I do have her zeal and I’ve done another alley sketch. Here it is, warts and all. I really enjoyed doing it. In sports there are regular references to athletes who play through the pain. I feel like I’m trying to do that right now with my sketching. I’m at a point where I can walk and stand but doing so requires a lot of energy because of my pronounced limp. Then, when I get on site, I further abuse my knee by sitting on my tripod stool. At the same time, a star finally appeared over planet Quebec City, or at least that’s what the astronomers call it. 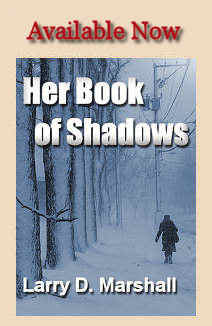 The result has been that we’ve got these things authorities are calling shadows and a lot more light than normal. It has also gotten warm enough that we can sketch outdoors. A fairly large group of us were downtown sketching. 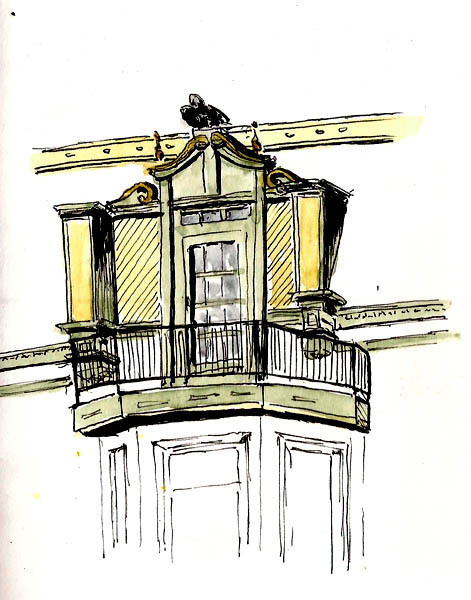 I learned later that everyone thought I’d gone home, I suppose, because of the grimace on my face when I walked, but actually I’d limped down to the south side of city hall and drew a street view. Normally I lose track of time when I sketch but on this day I knew every minute because my knee kept sending out tweets screaming about being harassed and abused. But eventually I did finish the sketch. I didn’t notice, until now, that I didn’t draw any of those shadow things I mentioned. I guess I’ll get used to those in time. When I finished I limped back to where everyone else was sketching. They were finishing up sketches and starting to talk about getting coffee. I sat down and with a couple minutes to fill, I started drawing some of the roof lines. Then we went to get coffee and reflect on the day. I think it’s going to be a long summer. I think I should be on the disabled list but don’t tell coach. There are parts of Quebec City that were originally built in the early 20th Century but that have since been modernized, mostly by putting modern facades on the buildings. The result is really boring. But if you wander around in said neighborhoods you find the odd house that has been spruced up a bit but that retains its older shape and aesthetic. Claudette found just such a house and we went to sketch it. It was a bit cool but sunny but on the upside, we had a great place to sit as we sketched. 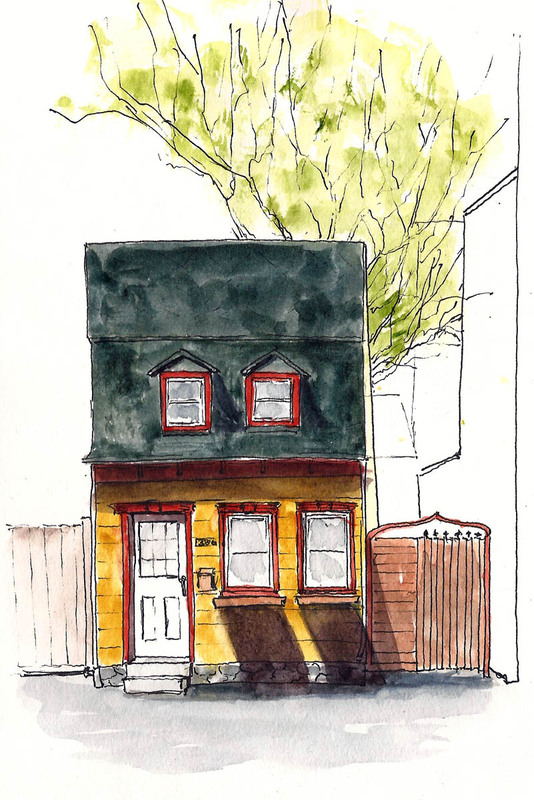 It was a small, simple house and didn’t take long to sketch but when I got out my watercolors I managed to dump half a bottle of water in my lap. Suddenly it got very cool and I looked as though I’d wet my pants. Life of a sketcher. 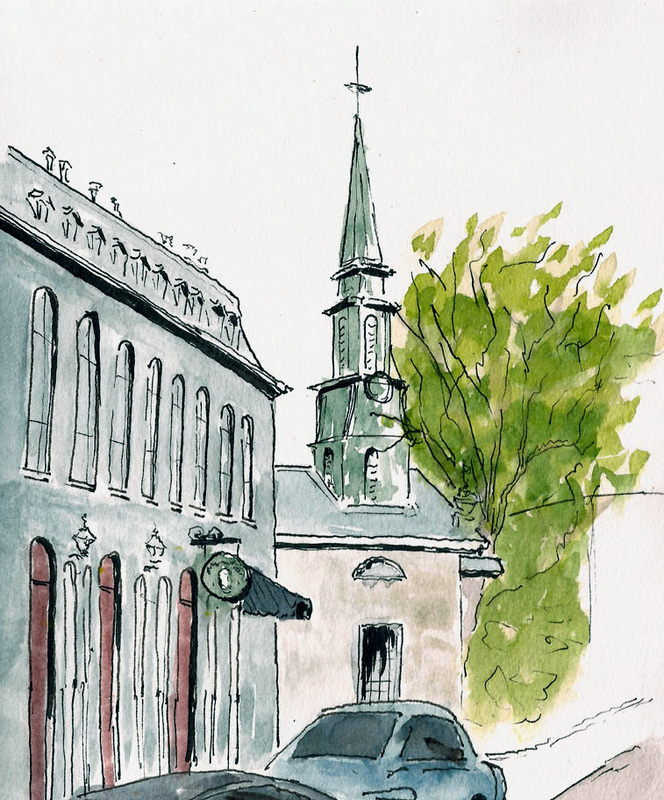 Back On St Vallier St.
We went back to St. Vallier with intent to sketch the Pignon Bleu, a building that I’ve always loved. Only problem was that someone, some horrible someone, took a gorgeous building and “renovated” it into something they obviously thought to be an improvement. Me, not so much. Claudette and Yvan agreed so we ended up sketching a very unique building across the street. My hand was not cooperating on this day. Arthritis is an unpredictable thing but one thing is certain. Having it in your drawing hand is frustrating. Because of this I decided that I’d just draw the fancy balcony facade. I still had some fun but I do wish you could buy replacement parts for old bodies. Quebec City and Levis are separated from one another by the St. Lawrence River, which is a mighty river for sure, serving as the shipping highway between the Great Lakes and the Atlantic Ocean. It seems to be a considerable barrier for our sketching group as we rarely go to Levis in spite of it being a great place to sketch. I could leave this description just the way it is, fully justifying our avoidance of that city, but the truth is, it’s only a 10-minute ferry boat ride so we really have no excuse. We did go last Saturday, though, thanks to an invitation by Marie Gauthier, who owns/runs an atelier in Levis. And we had a great time, though I spent way too much time talking to the new acquaintances. It was a cold day and I was underdressed so there was a bit of shivering going on as I drew this scene. I guess it’s my Arizona roots but I’m always underdressed for the cold. It’s the middle of May. A couple days ago we had frost warnings and right now our kitchen table is covered with annuals (plants) because it’s too cold to put them outdoors. But outdoor sketching season has started, though in fits and starts. 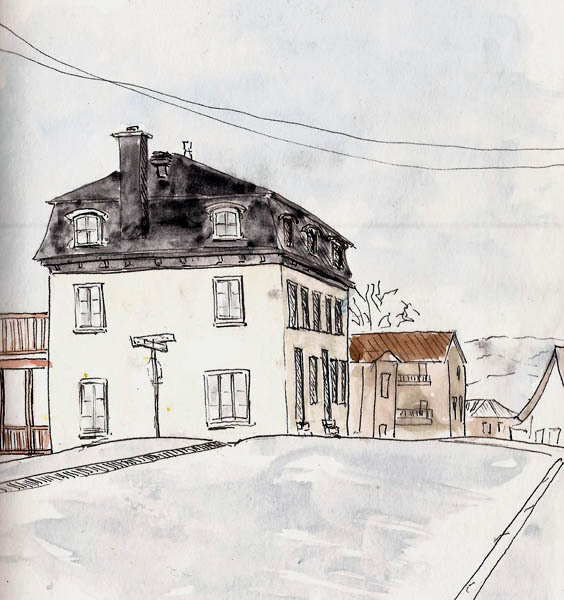 We met on rue St. Vallier in front of an old house Claudette wanted to sketch. I’d always thought it was a great subject myself. 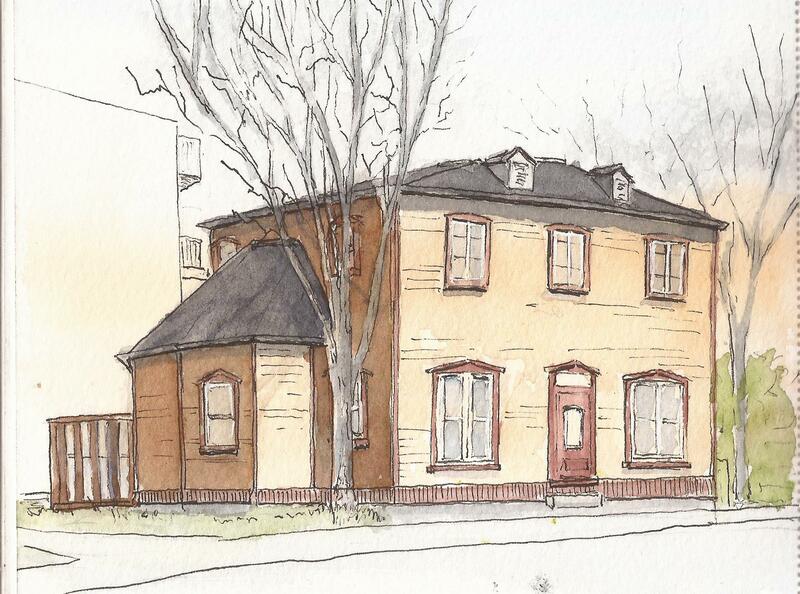 So there we were, three of us in a line along the street, drawing this house. I wonder if bears feel out of practice as they wander through the forest following exit from hibernation. After a long winter and a string of health problems, I sure feel clumsy sitting on a stool, doing the sketcher up/down bobble-head motion that identifies sketchers. I’m hopeless when it comes to watercolor. Partly this is because I don’t care enough about color but a heavy dose of ignorance about them adds to my problems with watercolor. So, it’s not likely that I’ll be telling anyone how to do watercolors anytime soon, but I have lots of experience messing up a drawing with the addition of color, so I thought I’d show you an example and let you cast some stones in my direction. Feel free to laugh. Here is a sketch I did as we launched our “outdoor season.” In fairness to me, it was a considerable struggle for me to get to the site and by the time I did my knee was throbbing and all I wanted to do was lay down (grin). I did a simple drawing of a wooden statue resembling the front end of a ship. Then, just for background, I did a really spartan outline of the building behind it for composition’s sake. Then I proceeded to make a mess of the whole thing. Note that there is no life in those colors. Note also that I’ve covered the entire drawing with those lifeless colors. This sketch would have been much better if I’d just left the background building white. The principle subject wouldn’t have sunk so far into oblivion. What a mess. At least it’s an example of what NOT to do. 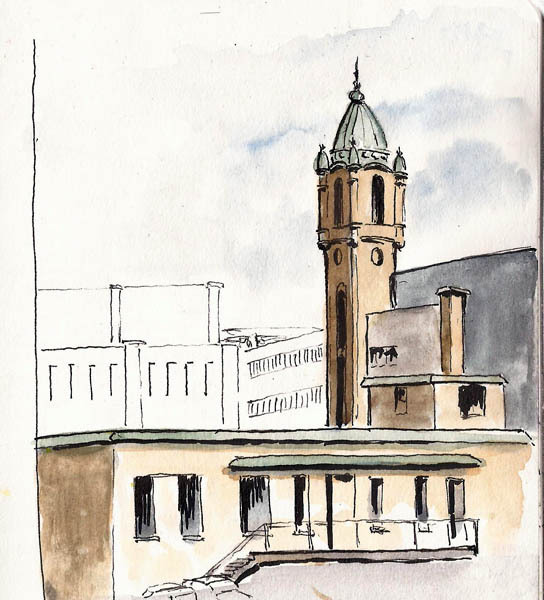 By the time I finished that sketch I was exhausted, but from the same location one could see the spire of what was a downtown fire station so we decided to draw it. I was still in blah-color mode but I like this sketch anyways. Most exciting of all is that we’re finally sketching outdoors.